Description: Sandcastle Theatre presents “Potter the Panto” a family friendly musical scheduled mid-December at the New Life Church in Collingwood. Directed by our very own, Laura LaChapelle with Musical Director, Nadia Mear and Choreography by Deanne Service. This is an original script by Sandcastle Theatre Founder, Stephanie Fowler that takes the Harry Potter story and turns it upside down. You can expect special effect with a very energic cast composed of 45 members. Joining Dianna in the studio for this week's BEACH CORNER is director, Laura LaChapelle Johnson, Nathaniel Porter-Gowan as “Snoop” and Hunter McCain as “Ron John”. Enjoy this great local program ON DEMAND from our Beach BOOSTER Radio Podcast Page. Photo: Nathaniel & Hunter in the Beach BOOSTER studio. Sandcastle Theatre presents “Potter the Panto” a family friendly musical scheduled mid-December at the New Life Church in Collingwood. Directed by our very own, Laura LaChapelle with Musical Director, Nadia Mear and Choreography by Deanne Service. This is an original script by Sandcastle Theatre Founder, Stephanie Fowler that takes the Harry Potter story and turns it upside down. You can expect special effect with a very energic cast composed of 45 members. Joining Dianna in the studio for this week's BEACH CORNER is director, Laura LaChapelle Johnson, Nathaniel Porter-Gowan as “Snoop” and Hunter McCain as “Ron John”. 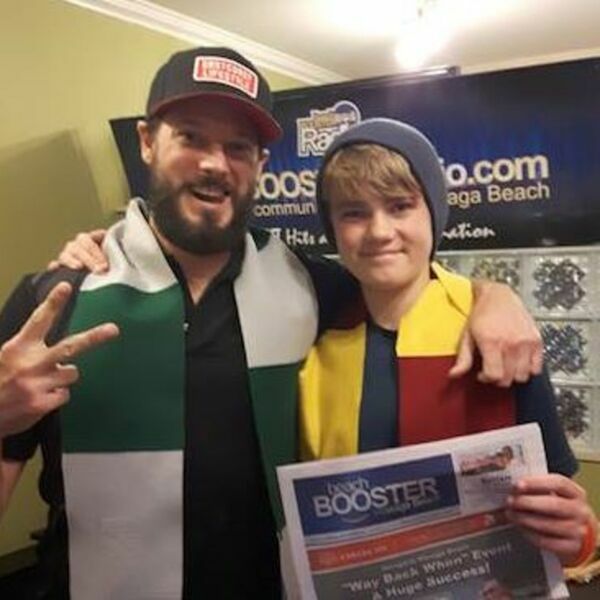 Enjoy this great local program ON DEMAND from our Beach BOOSTER Radio Podcast Page. Photo: Nathaniel & Hunter in the Beach BOOSTER studio.